Single Channel provide a cost-effective way to expand your server need. External RAID Storage Subsystem separate server and storage to provide better management. External RAID protection provide against Hard Drive failure. Simplifies server operation and maintenance by providing hot spare, auto rebuild, remote Web-based management. 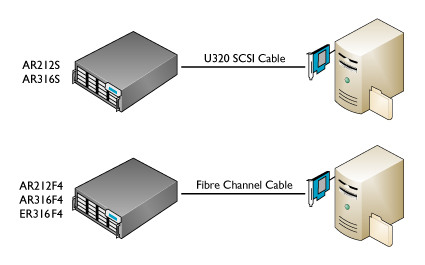 Performance up to 320MB/s for SCSI and 4Gbps for Fibre Channel. Note: Server equipped with SCSI/Fibre Channel Host Bus Adapter Controllers.